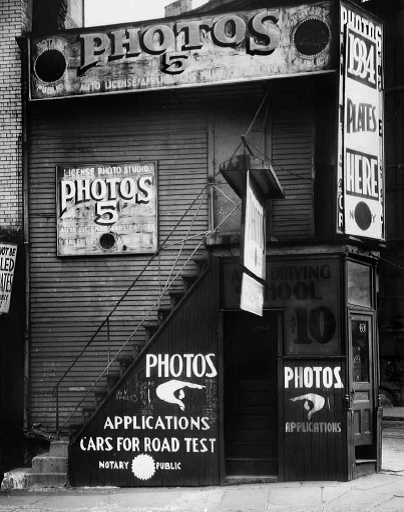 A few days ago, I wrote on American Photographs, an exhibit of the Depression-era photographs of Walker Evans, and my surprise at seeing how different these often-reproduced pictures looked in a museum setting. Well, readers, today I’m going to discuss Evans’s interest in symbols, and then what has become of representations he influenced. 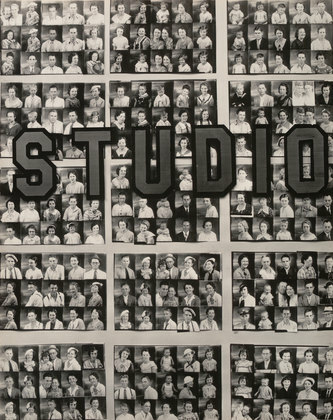 Many of the pictures Evans took of businesses have a symbol that conveys the trade conducted along with the words telling viewers what was done there. The semiotics of such representation interested him. Many of his representations work with symbols and semiotics—so much so that I actually did a bit of research ‘cause I was curious to see if anybody had written about this aspect of his work. It doesn’t look like it has been. So, briefly, I’m going to! Remember semiotics, reader? They are a type of symbol that conveys meaning without words. If you see a cluster of pink of red valentines (in chocolate boxes, cards, or balloons) in the local drugstore, for example, you do not need to be told “they are for Valentine’s day.” A pink or red valentine is associated with the holiday enough for the connection to be made wordlessly—purely by the symbol. I think he is playing with symbolism in this intriguing photograph. Obviously, this is a photography studio, of a sort. The manicules point to the door where would-be portrait subjects walk in. (The idea of “photos” overwhelms the picture, to me, but it appears to be the entry to a driving school as well.) Like many of his photographs, it is of a business. But it’s also a photograph, unlike the others, that is about photography: the studio mirrors and recapitulates the actions of taking a picture. You walk into a dark place that seems to be in some way reminiscent of the aperture of a camera. Indeed, it is an aperture, in the sense of opening. So Evans, early in his career, is having fun with the idea of photography and what auteur and subject do to make a photography. It’s even multiply determined, with the two manicules putting the entrant into their sights. But the legacy of his photography has become, in the late twentieth and early twenty-first century, divested of play of European influence, or theory. Weather-beaten signage and old advertising logo’s like those pictured by Evans have been, for several decades now, a preferred décor in mid-level burger joints (those that proudly describe themselves so). Indeed, what most struck me about this exhibit was the change in what the representations evoke. The same qualities that represented income inequality in the 1930s—the poor, weather-beaten quality of the wood and signage—now represents a sanitized past in those mid-level restaurants. A cheery past where 5¢ a photograph means that objects and services back then were cheap as water, easily affordable, and for everybody. The forms are thus a fit subject for nostalgia. What they embody in these restaurants is a type of American optimism that takes posted, weather-beaten signs and prices as a guarantee of obstacles overcome, because stuff was so laughably low in price—and because history tells us that the hardships of the 1930s were eventually overcome. Perhaps this décor is a form of wish that obstacles in the present will also dissolve. This post is going to continue my museum adventures. 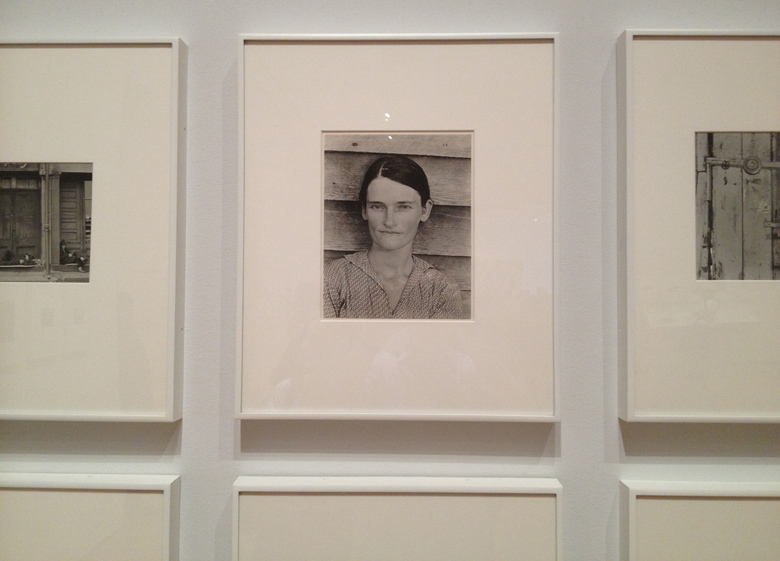 Last year, I went to the Museum of Modern Art to see American Photographs by Walker Evans, an exhibit that recreated his ground-breaking show of the 1930s, also at MOMA. (Last year’s exhibit celebrated the 75th anniversary of that exhibit, also called American Photographs. 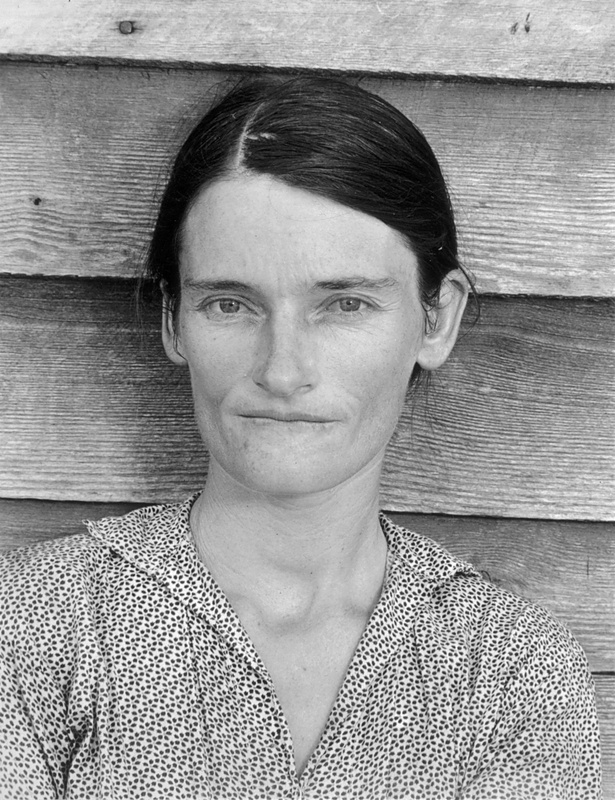 The photographs were later captured in his book with James Agee, Let Us Now Praise Famous Men, on southern sharecroppers during the 1930s. For most of us, a lot of these photographs are quite familiar, particularly of the farm families in Alabama. 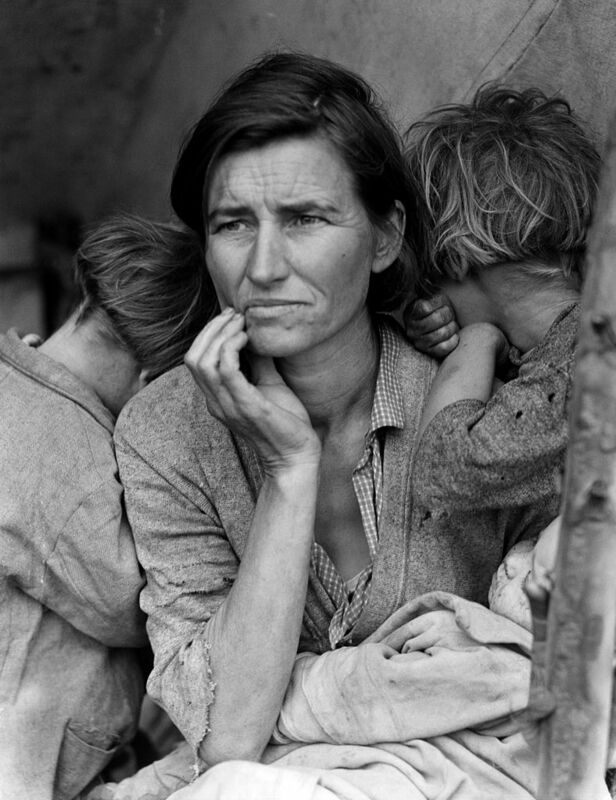 The photograph on the left, of Allie Mae Burroughs, for example, I think of in the same category as Dorothea Lange’s Migrant Mother (below on the right); a kind of “we look at the 1930s poor and in them, see the human face” moment that have served as examples of American photography in the American century as long as I’ve been an adult. They exerted a lot of influence. So the surprise I’ll be talking about in this blog is how different they looked from what I thought I had gazed on so frequently, and how different Evans’s photography seemed as a result. First, most are tiny. I include here a shot of MOMA’s book commemorating the exhibition, which displays a sheet of contact prints. Most of the photographs are the size of one of these prints. And to top it off, they are surrounded by a great deal of white matte backing that dwarfs the image, so that the entire representation is about 8 ½ x 11, surrounded by silver frame. Part of the impact of seeing poverty in these two photographs has always been the “we look at the poor and see their human face” reciprocal gaze (or, semi-reciprocal semi-gaze). But the size of the Evans photographs nearly obviates the possibility of reciprocity, as if we were looking through the wrong end of the telescope. (I have also included a picture of the Burroughs photograph on the wall—yet even that doesn’t convey the full effect of all that white space surrounding the figure. shot on the wall) The original size distances us from the subjects far more than their more conventional reproduction—as bigger—does. The American Photographs project always seemed like an offshoot of American realism and filled with sympathy toward those portrayed. The sizing makes it clear that these are as much representations of another piece of realism, though—the scientific specimen—as much as of the human face. Evans seems much less sympathetic toward them as a result. The museum’s notes on the exhibition also decenter these photographs slightly from an American context, making it clear that Evans was influenced by French photographers and their work documenting the working class. In fact, that piece of the exhibit shifted my idea of what Evans main reciprocity focus was: more on the art of other photographers then on his subjects, perhaps. I recently went to New York’s Metropolitan Museum to see several exhibits (most notably, El Greco, of whom your Meta-ist is very fond). But the exhibit I found most interesting was not the one I went to see but one I ducked into spontaneously: the nineteenth-century photographs of Carleton Watkins. Watkins was a very early photographer of the American West. 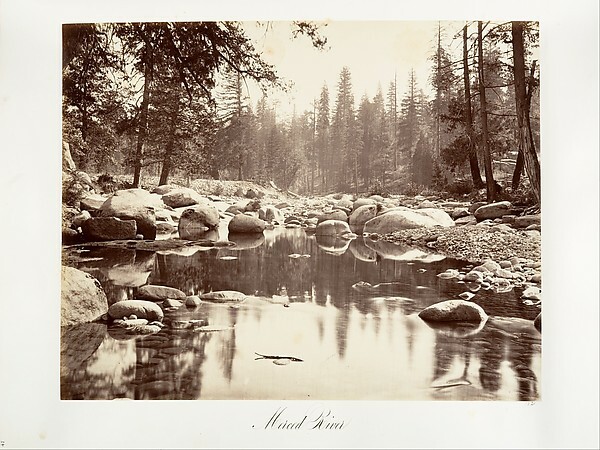 The exhibit featured Yosemite primarily. His photographs influenced then-president Abraham Lincoln to preserve the area. You can see the Met’s online collection of his photography here and there is also a website dedicated to his work: http://www.carletonwatkins.org/index.php. I include a sample so you can see the type of work he did. Two things about this strike me as someone interested in nineteenth-century archives. First, his work is not well known and seldom exhibited; indeed, according to carletonwatkins.org it had never been gathered together in one place prior to the Web site. This is such an example of how much the archives contain that is still underresearched. His work influenced the later Ansel Adams, a much better known (and more remunerated) nature photographer known for his work on Yosemite. But the second thing is simply the amazing amount of physical labor that went into developing the art of the American West. The exhibit included the heavy wooden cameras and information on the heavy plates of glass he toted up the mountains—in service to representations of them that resulted in their preservation. More tellingly, perhaps, it included the amount of hours—way into the double digits—that it took to travel from San Francisco to Yosemite, part of the way on roads, the west of the way in pure wilderness on pack mules. It reminded me of accounts of the architect Julia Morgan, another Bay area based artist (although of a later time), in going to William Randolph Hearst’s San Simeon. 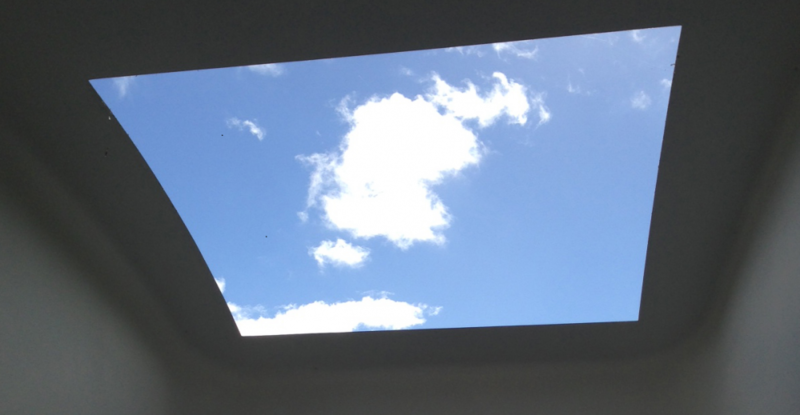 When she first began to consult regarding the architecture, the trip took nearly 2 full days. We tend to forget that roads had not been forged when the art that would define these areas began to be developed. Perhaps this strikes me in Watkins’s case because photography has become nearly an effortless art form (or seemingly so) in the age of the selfie–and also, perhaps, because California in the mid-twentieth century was so associated with ease and abundance. It was good to be reminded of how much effort was expended in breaking the ground. In his life, the aftermath of his photographic career was very sad: a lot of his work was destroyed in the 1906 San Francisco earthquake, he was penniless for a period of time, and is buried in an unmarked grave. He deserves many salutes for his beautiful work. So let this be one.